In my last post, I talked about looking for a caterpillar and finding a small tree frog on an arrowwood viburnum (Viburnum dentatum 'Chicago Lustre'). 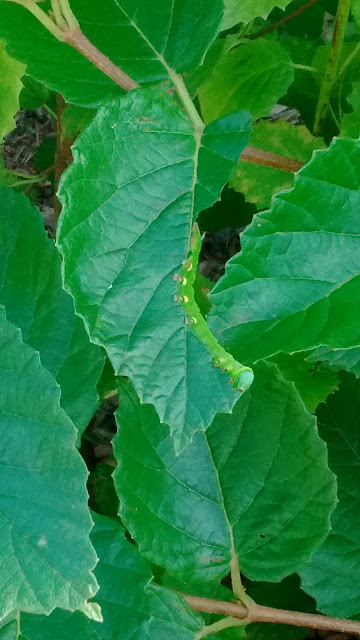 Today, on the same shrub, I found two large caterpillars that had been attacked by some sort of parasitoid wasps. The wasps - which I believe belong to one of the 15,000-plus known species of 'braconid wasps' - lay their eggs in the caterpillars. The larvae mature inside the caterpillar, then emerge to construct cocoons on the caterpillar's back, where they can metamorphose into wasps and continue their life cycle. Incidentally, I believe the caterpillars are the larvae of the hummingbird clearwing sphinx moth (Hemaris thysbe). The adult moth is quite beautiful. How many caterpillars can survive on a single fennel plant? I worry about whether these cats will have enough to eat, but since I only have the one fennel plant growing in my garden (I direct sowed a packet of seeds and only one plant grew to maturity), I don't think I have any options to relocate any of the cats. Hopefully they'll all make it to maturity and will be able to pupate successfully! So far, there's still plenty of foliage, but there are also lots of hungry caterpillars!